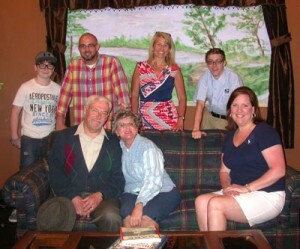 Here is the cast of On Golden Pond which opens at the Wm. M. Bouknight Theatre this weekend: Seated, left to right, Dave Engelman as Norman, Debbie Fryer as Ethel, Theresa Lambert as Chelsea; (back row) Nathan Noel as Billy, Allen Hatcher as Bill, Janet Johnson as the phone operator, and Carson Faulkner as Charlie. On Golden Pond by Ernest Thompson is an American treasure. It is a play that struggles with family issues, that laughs at provincialisms such as ethnic and gender prejudice (especially those of New England origin where the story is set), and deals with a subject that is often denied, that of growing old and dying. It is rich in meaty lines and quick humor. The Edgefield County Players, assisted by some who have crossed the River (Savannah) or the County Line (from Aiken) to bring their talent, have done it again in producing a noteworthy play. This is a funny play – not slapstick, mind you – full of wit and wisdom. Though set in New England, the ethnic and political allusions can be met with similar ones here in the deep South, to give a local flavor to a “down home” story. The fact that two great actors of days-gone-by, Henry Fonda and Katherine Hepburn, made notable these characters in the movie version of On Golden Pond (both Fonda and Hepburn had a certain fragility about them due to known health issues) only sheds more urgency on the local characters and their supposed fragile selves. Will there be another summer for Norman and Ethel? Norman’s response at the end probably settles that score. Noticeable, early in the play, is the fact of a more youthful cast. For reasons they seem to know best, each one is maybe ten years younger than the playwright suggests, except for that charismatic Billy – who, over and above his talent, just looks the part of a budding teenager! He is played by Nathan Noel, a veteran of several plays in Aiken. Then there is the daughter Chelsea whose pensive mood slows the pace of the play and sets the stage for a somber and emotional stirring, done well by Theresa Lambert of Augusta. One must not miss Debbie Fryer whose energy on stage is well known here (especially in Patsy Cline); and the rebuffs she receives from another William M. Bouknight veteran, Engelman, keep the audience expectant, waiting for the next line. New to the stage is Allen Hatcher of Edgefield playing Bill, the dentist, and he gives a good performance in his unease and withheld anger as he deals with his father-in-law-to-be. Bradley Watts of Aiken directs this play that opens this weekend, and if one is looking for encouragement to attend On Golden Pond, it would be good to know that he also directed Patsy Cline – one of the best shows yet. Coming up, also, he will be directing the musical written by local writer Leonard Todd as well as the next play, a drama, Second Samuel. And as for the “whatsie” of the cast of On Golden Pond, they are ringing it well!